Not long now, as the drivers take advantage of a three week break between Russia and the US to go on holiday and relax, before the push towards the final round of the season. November is set to be a busy month for the drivers, so they've been keeping things quiet recently - but I've still managed to pick up a few pointsworthy actions here and there. This week, we've got mountain biking through the forest, all the while wanting a completely different mode of transport. Also, a video from those warring teammates who seem to like each other again - long enough to wait for time to catch up with them, anyway. Plus, there's also a glimpse at what lies after F1, when drivers are forced to give up the day job. +5 Romain Grosjean: Grosjean reckons he has two announcements this weekend, and the clue to one of them is A FRIENDS REFERENCE! All the points. +2 Daniel Ricciardo: Planning to race with a pretty epic helmet in Abu Dhabi. -1 Nico Rosberg: Fun video, but watches "engineered for men" - psssshhh. -1 Lewis Hamilton: Fun video, but watches "engineered for men" - psssshhh. -1 Jean-Éric Vergne: Saying he wasn't nervous before his first day of school. How is that possible? +2 Kamui Kobayashi: Heading straight back behind the decks, not letting the day job (or lack of it) get him down. 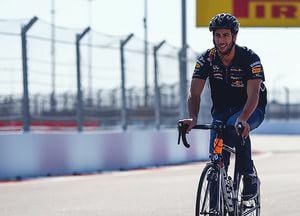 +2 Daniel Ricciardo: Nice interview with the BBC discussing his season so far, and why he's not allowed a motorbike!